After watching Pokemon - The First Movie, I decided to watch Pokemon Origins. It has a very strong link to the Pokemon games, starting off with the new game/load game option and an intro from Professor Oak who talks to you (the viewer) about Pokemon and if you wish to embark on a journey. Who wouldn't want to live or relive this in anime form? Anyway, we start off our own journey as we're introduced to Red, our main character in Origins. Fans of the anime know that Ash Ketchum is based off of Red, whereas Gary Oak is based off of his rival Blue. Naturally there are some links to each of their journeys, as Blue is Red's friend/rival that we see at certain points and wishes to fight Red too. Of course in the games you should have trained hard and captured stronger Pokemon at these points, and would have won these battles easily. If not then, train harder. Red is called by Professor Oak about something he has finished, which we all know is the Pokedex. After some time he meets Brock, voiced by the same voice actor for Lelouch in the dubbed version of Code Geass (highly recommended by me to watch). And cue the hp bars and battle music, and the "it's not very effective" etc. phrases! I want to play Pokemon again (only played Pokemon Diamond). And Red receives his first victory and a TM! Beginners to games will be able to learn from the anime as you learn about which attacks are effective against specific types of Pokemon, and which Pokemon types are stronger/weaker against other types for example. Veterans watching this may relive the moments when they first learned about these tactics throughout their journey to become the skilled players they are now. This makes for some good battles in the anime. Ash's journey doesn't let you relive that as much as Red's does, but is still good to watch. And the references! The diary bit you get when you load up a previously saved game, and the key items you receive as you progress through the game are just amazing. It really lives up to the Pokemon name in terms of story and game, and brings back memories from when I played Diamond. 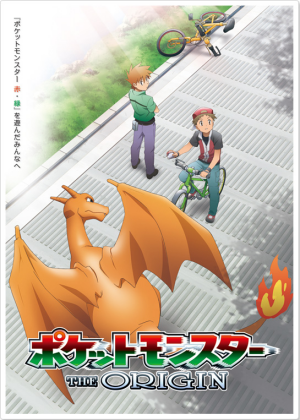 Pokemon Origins is one where you'll enjoy it as both an anime fan and gamer, which I highly recommend for its many references to the games and an amazing story as we see Red progress as a Pokemon Trainer. There are times when you'll love how much it refers to the games, and times where, if you've played the games, you'll be able to relate to Red's moments in battle and when you first went on your own Pokemon journey. There's never a dull moment throughout Red's journey, and you may feel like picking up Pokemon again. A boy embarks on a Pokemon journey to become the best trainer and complete the Pokedex.